This guide is for the 1980 Atari arcade game. For the 1998 Activision Windows game, see Battlezone (Activision). 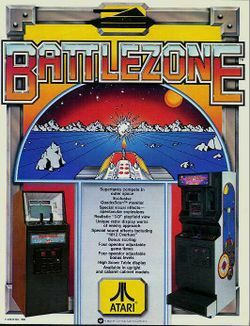 Battlezone is a first-person shooter arcade game which was released by Atari in 1980; it utilizes one Motorola M6502 (running at 1.512 MHz), with a Pokey sound chip running at that same speed, and a custom DAC. It was later ported to several other systems, and was included in several compilations - and common play in the U.S. can range from $0.25 to $1 per game (depending on how the cabinet is set). The default setting is $0.25 play with three lives and two bonuses at 15,000 and 100,000 points. The action takes place on a plain with a mountainous horizon featuring an erupting volcano, a distant crescent moon, and various geometric solids (in vector outline) like cuboids, cubes and pyramids; the player views the screen (which includes an overhead radar view! ), to find and destroy the rather slow tanks, or the faster-moving supertanks. Flying saucers and guided missiles occasionally appear for a bonus opportunity - and the saucers differ from the tanks in that they do not fire upon the player, and do not appear on the radar (but their appearance is signified by a "hovering" sound!). The player can hide behind the solids or maneuver in rapid turns once fired on to buy time with which to fire himself. Apple II version cover art. This page was last edited on 15 June 2016, at 07:58.